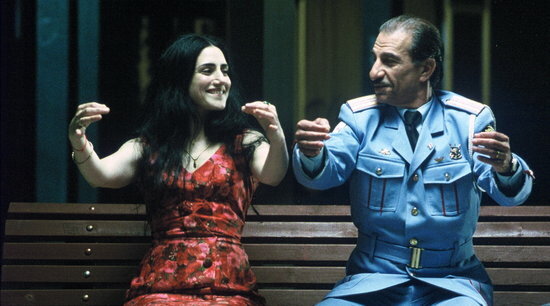 Movie Ramble: The Band's Visit. I think we've missed the last bus? 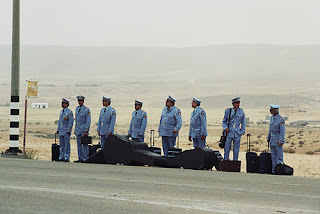 Kolirins movie tells the heart-warming story of the fading Egyptian Alexandria Ceremonial Police Orchestra whose eight members arrive in Israel to play at the Arab Cultural Centre. 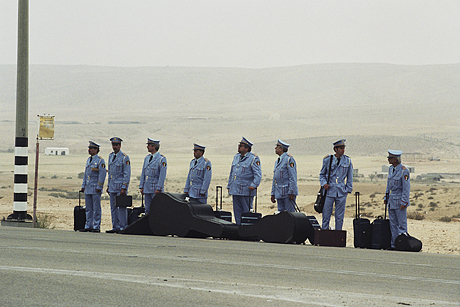 After a wee mix up they take the wrong bus and end up in the wrong town, a desolate windswept village in the middle of the Negev Desert. With no means of transport out of the village that day and with no hotels available they are forced to bunk down with the local townsfolk. This movie, which took four years to make, is a comedy with heart. It demonstrates how two so called enemies can come together and forget their differences but avoids sentimentality. Ronit Elkabetz, who plays Dina the owner of the small provincial restaurant where the band members dine, said to the director at the Israeli Film Awards "You remind us of a thing or two that we have already managed to forget. You showed us what would happen if we would stand before each other, Jews and Arabs and look each other in the eye" If only that philosophy were followed, think of the bloodshed you would avoid!!! As well Elkabetz who plays the lonely Dina “who refuses to wilt in her desert town” the films other outstanding performance is from Sasson Gabai the Iraq born Jewish actor who one the Best Actor Award for his portrayal of the leader of the Egyptian Orchestra Tawfiq Zacharya an actor whose facial expressions can save a dozen words. Even American jazz trumpeter and singer Chet Bakers mellow Funny Valentine gets a plug. Well worth adding to your rental list along with Lemon Tree if you have not seen it.